Morgan Spurlock’s debut documentary, Super Size Me, didn’t offer any revelatory information (eating McDonald’s everyday is bad for you? Say it ain’t so! ), but actually seeing the food’s physical effects on Spurlock in heavy doses made you question the merits of even the occasional Big Mac. 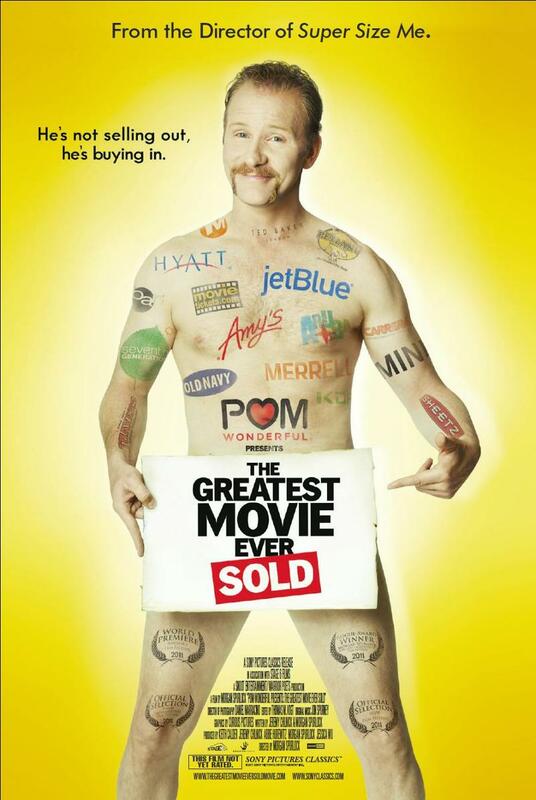 Spurlock’s latest venture, The Greatest Movie Ever Sold, again declares the obvious (product placement exists), but gives little motivation to ring the alarms. Mr. Spurlock sets out to fund his documentary on product placement by financing the entire film through product placement. The idea being that the process of courting potential sponsors will reveal their goals, the type of control companies then have over the final edit of the film, and overall just how insidious these corporate suits are. Combined with the familiar gallery of intellectuals (Noam Chomsky) and industry insiders (directors Quentin Tarantino, Peter Berg), it’s the traditional U.S. documentary as we know it today, thanks to the financial success of Michael Moore docs. But this format only works if you have a narrative arc in mind. Spurlock’s quest is admittedly blind to what will occur as he informs potential sponsors that their meetings are the movie. This is what sinks the film. Aimlessly bouncing around between meetings and talking heads, the movie is less of a film and more of an undeveloped web diagram. Spurlock touches on the ubiquity of advertising, then shows a city that banned public ads, then moves on to the supposedly stifling contract regulations with the sponsors, and finally showcases schools so poor they have to shill ad space on their buses. All of which is interesting, but is never stitched together to form a full tapestry–just an assortment of tea cozies. It’s not enough to play Captain Obvious with an issue, you need to tell us why we should care. The Greatest Movie Ever Sold demonstrates that a camera crew and a quest isn’t enough to make a compelling documentary. It needs just as much planning and foresight as a narrative fiction film, and an even better editor. To think otherwise is to insult the format and its greatest directors (Ken Burns, Errol Morris). Documentary filmmaking at its weakest. This entry was posted in Reviews and tagged Documentary, Morgan Spurlock, product placement, Super Size Me, The Greatest Movie Ever Sold. Bookmark the permalink.